Ahhhh Friday. The day that might as well be called Saturday based on how much I usually accomplish. (What?? For all you know Saturday could be the most productive day of my week.) This is actually not the picture I was going to post today. In fact, I had a completely different picture picked out, and I had even started writing up the post (I snagged the first sentence and kept it for the current instantiation of today’s entry), but then I decided I was going to mention what I’m doing this weekend, I realized that it would be much more appropriate to go this route instead. It’s probably fairly obvious, but this was taken immediately after the US scored their first goal in their eventual 3-1 victory. 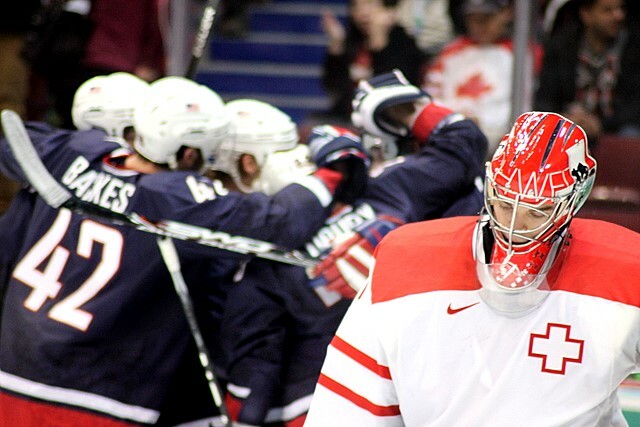 The Swiss team were of course huge underdogs in the game, but they played with heart. They never really threatened to win, but they certainly didn’t just roll over and give up. So it was a great game, and it was great to see everyone play with national pride. It was a great experience, I’m glad I went. Notes: Canon EOS Rebel T1i, Quantaray 70-300 mm lens. 1/500s, f/5.0, ISO 1600. Focal length: 227mm. i wish i had found something to do on my Saturday!